One of the West Bluff cottages on Mackinac Island, MI. 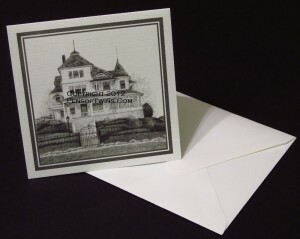 Card size is 4.75″ X 4.75″, with a top fold on 80# white linen card stock. Envelopes are 5″ X 5″ White Linen. Inside of card is blank. $8.99 per package of 8 cards/envelopes plus shipping. 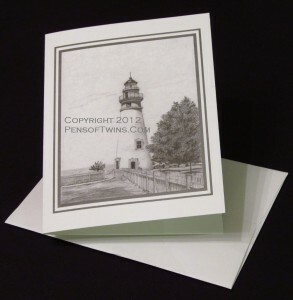 Card size is 5.5″ X 4.25″, with left side fold on 80# white linen card stock. Envelopes are A2 24# White Linen. Inside of card is blank. $6.99 per package of 8 cards/envelopes plus shipping.